Celery For Acne Treatment - Is It Safe And Effective? Celery For Acne Treatment – Is It Safe And Effective? Apium graveolens or more commonly known as celery is a vegetable which is devoid of any calorific value but at the same time offers a lot of nutritional benefits. If one could bear its strong flavor, then consuming this vegetable in large amounts would do a world of good in gaining from its nutritional content that might help in treating acne. Celery has the ability to cleanse and remove dirt from skin which helps in fighting and preventing acne. Aside from that, it can also help to diminish scars with no marks left behind. Unlike spinach, kale or broccoli, celery exhibits a lesser degree of nutritional ingredients required to treat acne. Typically, fifty grams of celery contains 4% of vitamin A, 2% of vitamin C, 1% of the required daily intake of magnesium and no zinc at all. All the nutritional content of celery is less than other vegetables in its group, but where it scores over the others is in its ability to enhance the flow of oxygenated blood to the skin and help in the treatment of acne. And another advantage is that celery is easily available and can be eaten raw. Celery is extremely rich in nitrates that occur naturally and this is true even in its powdered state or in its natural state of the stalk and leaves and contains 2.75% of this mineral which has the ability of enhancing blood flow. When celery is consumed, the ‘good’ bacteria in the mouth breaks down nitrates into its metabolite nitrinines and as this passes into the stomach, again the ‘good’ bacterial flora in the stomach works on the nitrinines and reduces them to the gaseous form of nitric oxide. This nitric oxide gas not only has the ability of dilating blood vessels but helps in boosting the immune system by getting rid of bacteria. By virtue of its vasodilating action, nitric oxide is integral for maintaining proper cardiac functions and blood pressure. It also ensures that adequate oxygenated blood reaches the extremities of the body and also to the skin. This ensures that the tone of the skin is properly maintained. But what is of significant importance of this improved oxygenated blood flow is the availability of acne preventing nutrients and anti-oxidants at the level of the skin cells. A study carried out to ascertain whether blood flow could be increased by consuming spinach, lettuce and celery, all containing nitrates, found that there was increase in the oxygenated flow of blood both at rest and exercise. The study also found a compound, 3-n-butyl-phthalide or 3 NBP which not only gives celery its distinctive taste when it combines with another compound known as sedanolide but 3NBP also significantly improved the flow of blood. It is worth noting that back in 2002; the Chinese government endorsed the use of 3NBP for treating cerebral ischemia. Various other studies have found that 3NBP significantly improved blood flow to the brain. This increased blood flow not only prevented the death of neurons but also helped in rejuvenating capillary formation of the brain while at the same time strengthening and improving microcirculation in the existing capillaries. Although improved blood flow to the brain doesn’t guarantee improved blood circulation to the cells of the skin but with the presence of nitrates the possibility was there the study concluded. Yet in another large study, it was found that blood pressure was significantly lowered by three vegetables when consumed raw, namely, celery, scallions and tomato out of twelve other vegetables. The convenience of consuming celery makes it a better choice in treating acne when compared kale or broccoli. The beneficial properties of celery go beyond improving blood flow. It’s been found also to decrease inflammation. This has been purported by one James Duke who has claimed to have noted more than twenty anti-inflammatory ingredients present in celery. One of these ingredients, luteolin, a flavonoid derivative anti-oxidant, was found to reduce inflammation associated with acne by inhibiting the secretion of interleukin-1b, TNF-a and COX-2 both in the blood and the brain. The luteolin content per 100 grams of celery is 1.05 mg and is the normal range but it is still more than kale with 0.00mg, broccoli with 0.00mg and spinach with 0.74mg but is less than red grapes with 1.30mg. This makes celery stand out amongst the other vegetables but in reality a Chinese variety with more foliage containing 34.87mg of luteolin per 100 grams was perhaps the reason for this acceptance. 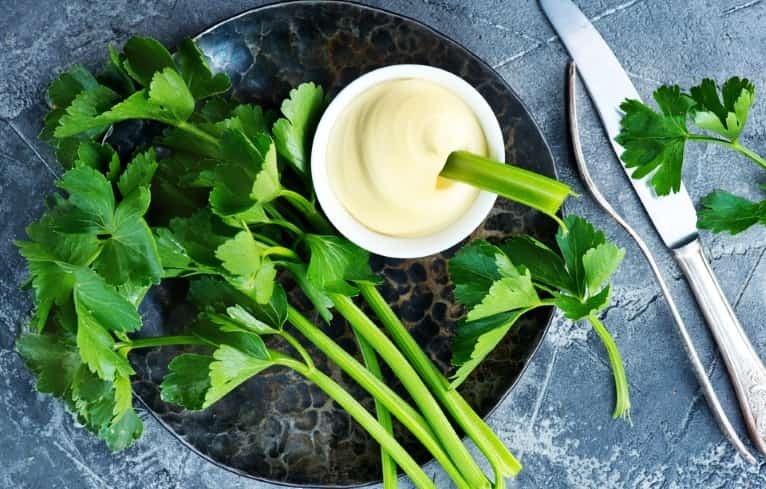 Another flavonoid, apigenin, found in celery is highly concentrated to the tune of 2.85mg per 100 grams and exhibits powerful anti-inflammatory action against COX2 as confirmed by a separate study. But on the other hand, it was found that parsley had higher content of apigenin at 215.46mg per 100 grams. The anti-oxidants found in celery are in adequate amounts, even those in grocery stores but there are other vegetables that contain higher amounts of anti-oxidants as compared to celery. For instance quercitin, another anti-oxidant present in celery has 0.39mg but brown onions in the raw form have 21.4mg, boiled asparagus has 15.16mg and raw cranberries have 14.84mg per 100 grams. However, where celery scores over others is in its potency to stimulate the body’s own anti-oxidant producing capacity. In a study, it was found that the anti-oxidant levels in celery catalyzed the body to increase the production of dismutase and catalase along with glutathione-s-transferase enhancing the detoxification of heavy metals. To get the most out of celery, consuming the leaves is the best option as they contain highly concentrated amounts of anti-oxidants. So when buying celery, it would be worthwhile to get a bunch with a lot of foliage to derive maximum benefits. Although the anti-inflammatory and anti-oxidizing property of celery is less compared to other green vegetables but it offers its unique property of dilating blood vessels thereby improving the flow of oxygenated blood to extremities and the skin as well. And perhaps this is the single most important reason to consume celery. The ingredients in celery do not pose much of health problems when consumed. With sugar content being a low 1.8 grams per 100 grams and reasonable amounts of oxalate in the range of 11 to 20mg, celery scores over almonds and spinach in the latter aspect where almonds have 750 to 800mg and spinach has 380 to 470mg per 100 grams. Oxalates in foods have the potency to precipitate renal stones but they do not affect acne except in sensitive individuals where inflammation is observed. The only downside with celery is the presence of pesticides. Being easily susceptible to insecticides, pesticides and herbicides, the contamination levels in it are not desirable. In fact in 2010 celery ranked number one in terms of contamination followed by being ranked fourth in 2014 and recently in 2017 it stood at ninth behind apples, strawberries and peaches. Although corrective measures have been put in place to check contamination, still being ranked ninth out of a total of forty eight crops does not look good. One such insecticide, acephate, developed to kill insects was indentified to have been present in 34.7% of celery crop in the year 2010. Besides killing insects, acephate also has the potency to reduce the efficacy of anti-oxidants when consumed. This is counterproductive to acne treatment. Acephate is also harmful to male fertility and exhibits a powerful xenoestrogenic action. With a long half life ranging between ten to fifteen days, the effects are pronounced. This could be the cause of many couples who cannot have a baby. The adverse effects of pesticides from just one single source will not be sufficient to cause any marked complications to the skin. But when one consumes various foods laced with pesticides over a period of time it is then that the adverse effects begin to get pronounced. This happens as a result of the efficacy of anti-oxidants becoming reduced. This is similar to using cosmetics. The chemical content in any one such item will not cause much of a problem but using a host of them on daily basis will definitely lead to complications on the skin ultimately leading to acne. And the way around this situation is simply avoiding any source that has the potency to precipitate acne such as harsh chemicals in cosmetics or agricultural chemicals in food. Simply washing celery under tap water before consuming it will not suffice in getting rid of the harmful pesticides. Even putting celery through tough industrial washing, as mandated by the FDA before agrochemical testing, was not enough to remove much of the pesticides. But when one compares conventionally grown celery to an organic one, it is more economical than other organic fruits or vegetables like blueberries or raspberries. Besides being cheaper, organic celery had the same amounts of magnesium and calcium but the nutrient contents of vitamin C and zinc were significantly higher in the range of 118.18% and 47.93% respectively. These nutrients are not present in conventionally grown celery. This could lead to better availability of anti-inflammatory and anti-oxidative compounds. According to an agricultural study conducted in 2017, avocados, sweet-corn, pineapples, onions and cabbage make up five of the crops that are free of any chemicals, are economical and provide excellent nutrition to prevent acne. There’s been a lot of speculation regarding the effect of celery in increasing or boosting memory power. While this is true but the effects are not that pronounced as this property of improving brain health is dependent on luteolin. The following studies demonstrate this. Case 1 – This study was carried out on mice, where 26 were adults and 26 were young. They were given 20mg of luteolin daily and put in a maze. Following the administration, there was a marked increased in their spatial awareness which allowed them to get out of the maze. The results were similar in both groups. Case 2 – Another study proved that reversal of memory loss due to Alzheimer’s and improvement in spatial awareness could be achieved with supplements of luteolin. Case 3 – In another study, luteolin was found to scale back memory deficiency and learning disabilities in rats by improving transmission between synapses of the brain. The study concluded the potential of luteolin in protecting brain function and improving memory. Case 4 – In yet another study carried out on rats, luteolin scaled back both learning and memory deficiency caused by the buildup of amyloid-β peptide; improved anti-oxidants levels in the brain along with the rise in glutathione and dismutase. This is promising because Alzheimer’s is caused by excessive buildup of amyloid plaque which is mostly amyloid-β peptid. Although the above studies brought out the anti-oxidative property of luteolin in offsetting memory loss but like its anti-inflammatory effect, the amount of luteolin in celery is too small to make a significant mark. Celery has only 1.05mg of luteolin per 100 grams and the first study administered 20mg daily. The luteolin content in celery has been long exaggerated when in reality its content is marginally higher than other vegetables and offers a slight benefit. But it scores over other vegetables by its ability to improve blood flow in the brain by stimulating the secretion of 3NBP. But there are other foods rich in luteolin that one can consume. For instance one of the best sources of luteolin is Mexican Oregano which has 1028.75mg per 100 grams of celery. Other food sources include Chinese celery with 34.87mg; spice of celery seed with 811.41mg; juniper berries with 69.05mg; radicchio with 37.96mg and thyme with 45.25mg per 100 grams. Parsley, sage and thyme are easily available and contain adequate amounts of luteolin for beneficial results. Besides these, celery seeds can easily be purchased online in large quantities. There are certain fruits and also vegetables that can be compared to celery in terms of luteolin content per 100 grams. Lemons with 1.90mg; chicory greens with 2.08mg; cantaloupe melons with 0.64mg; red grapes with 1.30mg and green kiwi fruits with 0.74mg. Consuming a mix of the vegetables, herbs and fruits listed above, which are rich sources of luteolin, along with celery should produce the expected benefits. As a pure acne fighting agent, celery is not as potent as spinach, broccoli or kale but where improving blood flow to the skin fast is concerned, organic celery is better off. Moreover, celery offers the convenience of munching on its stalk at anytime, but the same cannot be said about spinach another rich source of nitrates. Fighting acne with vegetables depends on consuming a variety of different vegetables with their own inherent beneficial properties. For example, blood flow can be improved with organic celery, while broccoli on the other hand helps in controlling inflammation; levels of vitamin A can be increased with kale, while garlic and onions help in the formation of glutathione. Every fruit or vegetable has its own beneficial property in preventing acne. It’s all about consuming the right combination to achieve desired results.